The 91st National FFA Convention was held October 24-27. Thirteen Fillmore Central FFA members attended and participated in this year’s convention, held in Indianapolis, Ind. Eleven members attended with advisor, Mr. Kurt VanDeWalle, and student teacher, Mr. Lynn Hanson. These members were Gunnar Gewecke, Jared Engle, Sadie Birky, Kaylea Geiser, Brook Jensen, Connor Asche, Thayne Kimbrough, Dakota Nun, Finn Neiman and Jared Stephens. Two graduated members received their American FFA Degree on October 27. These members were Logan Peppard and Garrett Whitley. This year’s convention theme "Just One," was evident throughout the convention. The theme was meant to inspire FFA members that "just one" person can make a difference, "just one" decision can lead to success, "just one" experience can lead to a better life. The members attended sessions where National FFA Officers gave their retiring addresses, awards were presented, sponsors were recognized, and keynote inspirational and motivational speakers took the stage. FFA members selected leadership development and career building workshops to attend. Our members also toured an orchard and vineyard near Louisville, Ky., the Louisville Slugger Bat Factory and Churchill Downs. 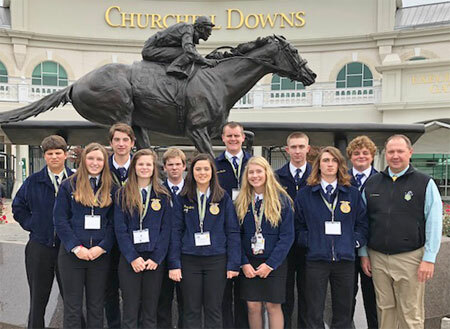 When members were not at workshops or on the tour, they visited the Career Expo, FFA Mall, the Hall of States exhibits and the Agriscience Fair displays. At the Career Expo, members interviewed an industry professional and talked to representatives from a variety of agriculture industries and colleges. This year, the members had a little extra fun by attending a concert with Garth Brooks, which was opened by Ned LeDoux. 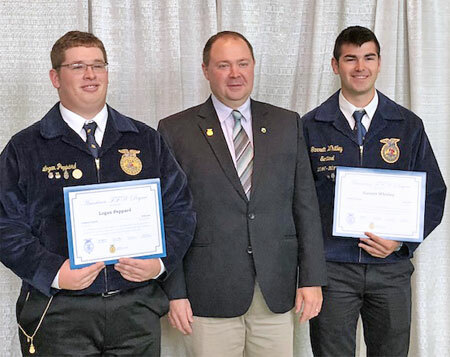 Logan and Garrett attended on Saturday to walk across the national stage to receive the prestigious American FFA Degree. They traveled to Indianapolis with their parents, Marty and Kathy Peppard and Jeff and Barb Whitley. The American FFA Degree is the highest FFA degree and demonstrates the maximum level of commitment to FFA and the significant accomplishments in their Supervised Agriculture Experience. Less than 1 percent of FFA members earn this degree. Mr. VanDeWalle is proud of these two members’ dedication and involvement. School administrators and the FFA Booster Club are appreciated for providing the opportunity to attend. Our Booster Club also supported us financially with food that was brought on the trip, a chapter meal to celebrate the American Degree recipients and travel expense assistance for Logan and Garrett.